Obituary – LeForce, Rolland “Rollie” Leon « Perry High School Alumni Association, Inc.
Basketball ’64-’65, F.C.A. ’64-’66, Track ’63-’64, F. T. A. ’64-’65. Roland “Rollie” LeForce, 48, Evanston, WY, formerly of Perry, died at 11 a.m. Friday, April 11, 1997, at L.D.S. hospital in Salt Lake City, UT. Funeral was at 2 p.m. Tuesday at the First United Methodist church of Perry. Rev. Cortez Cranfill, pastor, officiated. Burial was in the Fairview cemetery under direction of Brown Funeral home of Perry. Casket bearers were Nathan LeForce, Tracy Cross, Wayne Kuntz, Cecil Leeper, Ronnie Gottfried and Leonard Gottfried. Honorary bearers were Bill Classlin, Cleo Gottfried, Ken Savage and Sean Sullivan. LeForce was born at Guthrie on Oct. 7, 1948, the son of Clyde Raymond and Lila (Day) LeForce. He was a 1966 graduate of Perry high school and attended Central State university one year. 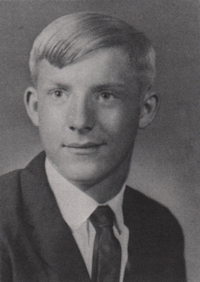 On July 29, 1967, he and Flora Keith were married at Perry. He served in Vietnam with the United States Marines from 1968-70. An oilfield construction worker, LeForce had been employed by R.L. Frailey of Perry for 17 years. At the time of his death, he was vice president of Elkhorn Construction of Evanston. Memorial contributions may be made to the transplant unit of L.D.S. hospital in Salt Lake City. In addition to his wife, survivors include one daughter, Jeana Sue Cross, Perry; one son, Nathan Arron LeForce, Evanston; four grandsons, Danial Leon Cross, Devin James Cross and Dominick Don Cross, all of Perry, and Joseph Roland LeForce, Evanston; his parents, Lila and Clifford Busse, Perry; three brothers, Doug LeForce, Perry, Frank LeForce, Albuquerque, NM, and Chris Busse, Delaware, OK; and two sisters, Connie Betchan, Perry, and Tawni Herring, Stillwater. He was preceded in death by his father, Clyde LeForce, and one brother, J.D. LeForce.